When you need to keep track of time for a job, ZipBooks has got you covered. We’ll help you keep accurate, exact records of the time you and other team members spend, so you’re sure to get paid for every minute. If you’ve got more than one person working on a billable activity, add teammates to make sure everyone’s time is tracked correctly and efficiently. Don't spend hours on a project and then forget to include it on your customer's invoice! Working for free is not the best thing for your business. 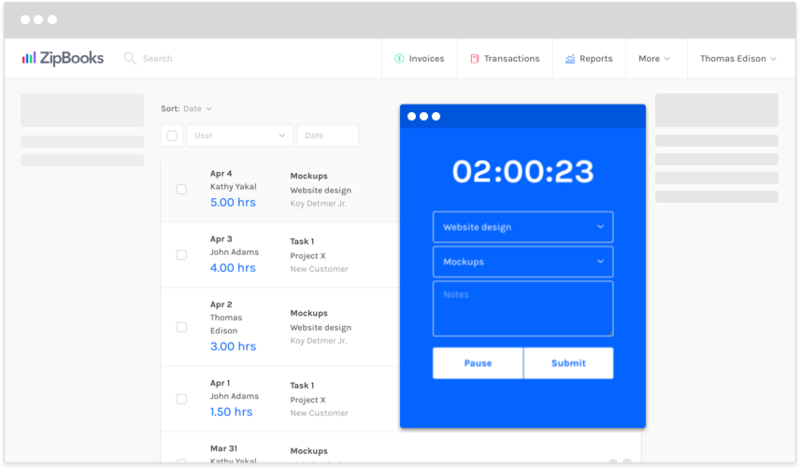 ZipBooks will automatically import your time into a designated invoice, so you don’t forget to bill for your hard work. When you need to keep track of time for a certain project, ZipBooks will hold the stopwatch for you. Create projects and assign them to customers, and then add specific tasks to those projects. Track the time all team members spends on tasks individually, as well as the total time spent on the project as a whole. Just click the start button in your web browser or iOS app, and your time is being tracked.